Have you ever considered that as a small business owner, you’re an inspirational part of the local community? You are not just selling a product or service, but an experience. You’ve made your dream into a profitable reality; but how have you done that? Consider what brings people into your brick-and-mortar location; is it your great service, customized offerings or the atmosphere in your shop or office? Whether you’re an online entity or have a physical location, you have a great opportunity to create loyal consumers and advocates for your business. Does this align with my business? Share things that are relevant to your industry or the community specifically. Does this help the community? This is key as it shows the community at large that your business cares for them. One of the best ways for your small business to consistently know what’s going on is to join the local chamber of commerce. The chamber exists as an advocate for local businesses, to stir the local economy and to serve as a bridge connecting people, government offices and businesses. If something big is going on in the community, the chamber of commerce usually knows about it and communicates it to members. You can take their information and share it or, if there is a tie-in to your business, spin it to draw consumers in. For example, if the chamber is promoting an upcoming community festival and you’ll have a booth, talk up the event for everyone, but remind people to check in with you. Not all news is good, and in the case of a major event affecting the community, take the opportunity to respond to it in a meaningful way. You could publish a blog post, do a public service announcement (PSA) or tweet using a specific hashtag. Be careful not to take a negative approach or get involved in the politics of the situation. You are there to be supportive, not offensive. When your small business hosts major events, like an annual sale or open house, make it a social media “event”. Use your major social media platforms like Facebook, Twitter and Instagram for the best results. Social media has the potential to expand the reach of your business further than your immediate community. Most consumers only want to drive 17 minutes, on average, to get to a location, but this changes based on what goods and services are offered. For instance, consumers are willing to drive a longer time, approximately up to 20 minutes, for life-essential services like doctors, lawyers and accountants. But those same consumers will only drive up to 14 minutes to get to recreational activities, like the gym or a local bar. If your social media page provides good information, in addition to good service experiences in person, consumers are more likely to drive a little further to engage with you. By using your social media accounts to engage locals with helpful information and fun promos, you draw attention to your location and can attract new visitors. As a business owner, you should consistently network and connect with businesses that complement your services. Be sure to connect both online and at the street level. A fun way to do this is to host joint events. For example, a local pet store owner could connect with a local dog groomer to sponsor and promote an event together at the pet store’s brick-and-mortar location. This has the potential to boost community engagement for both businesses, by taking care of the needs of pet owners in the community. Consumers remember and look forward to events like these because it serves them well. Community is about people, meaning it’s important to actively engage with the people. Simply responding to posts and questions, consistently, on your website and social media pages shows your customers that you care about them. Encourage and invite influential community members to contribute ideas and information for your business, via blog posts or content on your website and social media pages. This is especially effective if you can get powerful, well-known people in your community to work with your business. If you’re providing great products and services to them, this should not be difficult. There’s a big, little local world outside of your small business’s four walls, so get out there and interact with the community. You will see great rewards in business by just inviting your local community into it. What ways do you engage with your local community? What is your favorite thing about the community you serve? 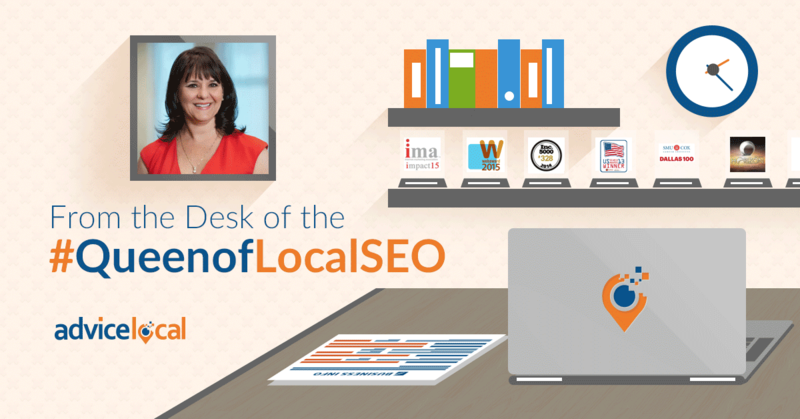 Be sure and come back each week for more on local business marketing from the #QueenofLocalSEO. The essential key is building relationships – with your clients, with your employees and contractors, with your community, with your vendors, and with strategic partners. Toward that end, I would highly recommend (I’d require it if I could) that all small business owners join their local chapter of BNI (Business Network International). I’ve been a member for 20+ years and the relationships built there routinely bring in a large percentage of our business every year!